Create a keepsake that last a lifetime when you present your birthday boy or girl with an Engraved Star Keepsake celebrating their birthday. This elegantly engraved Personalized Star Keepsake measures 5" x 5" with edges measuring 3/4" thick. Includes FREE Personalization! 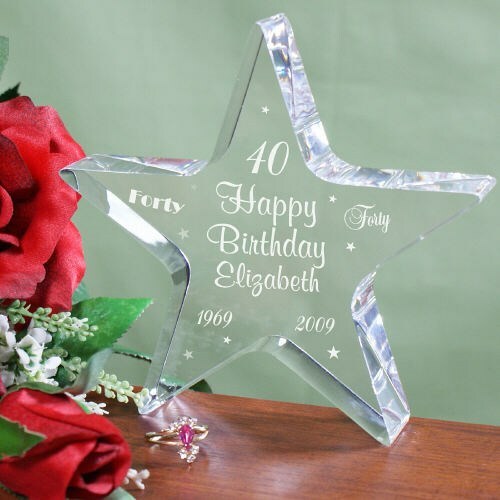 Personalize your Birthday Star Keepsake with age, any name, birth year & milestone year. Additional Details When celebrating a special birthday, make the moment memorable with Personalized Birthday Gifts from 800Bear.com. Be sure to also add to the fun of gift giving by also including our Engraved Happy Birthday Picture Frame and our cuddly Personalized Birthday Presents Teddy Bear.